It's helpful to use financial calculators when you're making financial decisions. It's also really important to understand the information you enter into the calculator (inputs) and the information provided once the calculation is complete (outputs). 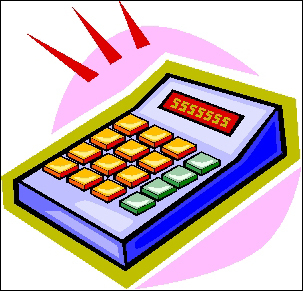 This calculator provides the monthly payment for a traditional amortized loan like a mortgage or a car payment. Just enter the loan term, the interest rate and the loan amount and then click the button to calculate the monthly payment. You can also use this calculator to calculate student loan payments. The loan term (number of months) is how long the loan lasts. It's also the number of payments you will make to completely pay off the loan. The interest rate is what you will be charged to borrow the money. The loan amount is also known as principal. To calculate the total borrowing cost of a loan once you've made all of the payments, simply multiply the monthly payment X the number of payments and then subtract the initial amount borrowed (principal). Here's a simple financial calculator to help track how much money you can save by packing lunch rather than eating out. Even a few dollars a day can really add up! More financial calculators will be added...stay tuned!